Julian Assange: Cyber-Libertarian or Cyber-Anarchist? Julian Assange, the notorious founder and director of WikiLeaks, is many things to many people: hero, terrorist, figurehead, megalomaniac. What is it about Assange that makes him both so resonant and so divisive in our culture? What, exactly, does Assange stand for? In this post, I explore two possible frameworks for understanding Assange and, more broadly, the WikiLeaks agenda. These frameworks are: cyber-libertarianism and cyber-anarchism. First, of course, we have to define these two terms. Cyber-libertarianism is a well-established political ideology that has its roots equally in the Internet’s early hacker culture and in American libertarianism. From hacker culture, it inherited a general antagonism to any form of regulation, censorship, or other barrier that might stand in the way of “free” (i.e., unhindered) access of the World Wide Web. From American libertarianism it inherited a general belief that voluntary associations are more effective in promoting freedom than government (the US Libertarian Party‘s motto is “maximum freedom, minimum government”). American libertarianism is distinct from other incarnations of libertarianism in that tends to celebrate the market and private business over co-opts or other modes of collective organization. In this sense, American libertarianism is deeply pro-capitalist. Thus, when we hear the slogan “information wants to be” that is widely associated with cyber-libertarianism, we should not read it as meaning gratis (i.e., zero price); rather, we should read it as meaning libre (without obstacles or restrictions). This is important because the latter interpretation is compatible with free market economics, unlike the former. Cyber-anarchism is a far less widely used term. In practice, commentators often fail to distinguish between cyber-anarchism and cyber-libertarianism. However, there are subtle distinctions between the two. Anarchism aims at the abolition of hierarchy. Like libertarians, anarchists have a strong skepticism of government, particularly government’s exclusive claim to use force against other actors. Yet, while libertarians tend to focus on the market as a mechanism for rewarding individual achievement, anarchists tend to see it as means for perpetuating inequality. Thus, cyber-anarchists tend to be as much against private consolidation of Internet infrastructure as they are against government interference. While cyber-libertarians have, historically, viewed the Internet as an unregulated space where good ideas and the most clever entrepreneurs are free to rise to the top, cyber-anarchists see the Internet as a means of working around and, ultimately, tearing down old hierarchies. Thus, what differentiates cyber-anarchist from cyber-libertarians, then, is that cyber-libertarians embrace fluid, meritocratic hierarchies (which are believed to be best served by markets), while anarchists are distrustful of all hierarchies. This would explain while libertarians tend to organize into conventional political parties, while the notion of an anarchist party seems almost oxymoronic. Another way to understand this difference is in how each group defines freedom: Freedom for libertarians is freedom to individually prosper, while freedom for anarchists is freedom from systemic inequalities. In many ways, the Internet community / hacker collective known as “Anonymous” are the archetypical cyber-anarchist group. As their namesake indicates, they embrace a principle of anonymity that places inherent limits on hierarchy within the group. Members often work collectively to disrupt the technology infrastructure of established institutions (often in response to perceived abuses of power). All actions initiated by the group are voluntary and it is said that anyone can spontaneously suggest a target. The ethos of the organization was well-captured in a quote from one of its Twitter feeds: “RT: @Asher_Wolf: @AnonymousIRC shouldn’t be about personalities. The focus should always be transparency for the powerful, privacy for the rest.” [Author’s Note: The previous sentence was ambiguously phrased. @Asher_Wolf is not personally affiliated with Anonymous. I meant merely to suggest that her comment was insightful. My apologies to her if readers were misled.] Note that this implicit linkage between transparency and accountability is what distinguishes a cyber-anarchist from other run-of-the-mill anarchists. For the cyber-anarchist, the struggle against power is a struggle for information. It’s not correct to put me in any one philosophical or economic camp, because I’ve learned from many. But one is American libertarianism, market libertarianism. WikiLeaks means it’s easier to run a good business and harder to run a bad business, and all CEOs should be encouraged by this. […] it is both good for the whole industry to have those leaks and it’s especially good for the good players. […] You end up with a situation where honest companies producing quality products are more competitive than dishonest companies producing bad products. Yet, WikiLeaks frequently engages in what might be interpreted in as anti-business activity—distributing proprietary information (e.g., documents that indicate insider trading at JP Morgan, a list of companies indebted to Iceland’s failing Kaupthing Bank, legal documents showing that Barclays Bank sought a gag order against the Guardian, a list of accounts concealed in the Cayman Islands, etc.). In fact, Assange claims that 50% of the data in their repository is related to the private sector. So as far as markets are concerned I’m a libertarian, but I have enough expertise in politics and history to understand that a free market ends up as monopoly unless you force them to be free. I’m not a big fan of regulation: anyone who likes freedom of the press can’t be. But there are some abuses that should be regulated […]. Traditionally, regulations are controls placed on one set of institution (i.e., businesses) by another institution (i.e., government). Here, I think, is where Assange’s fundamental thinking is revealed. He does not trust institutions to regulate each other, because he does not trust institutions. He seems to believe that institutions, and their propensity for secrecy, have a corrupting effect. This is why he champions individuals and small groups—extra-institutional actors—as change agents. Anti-institutionalism appears to be Assange’s driving principle—even more so than his appreciation for markets. This, paired with his skepticism toward capitalism, seems to indicate that Assange better fits the ideal-type of the cyber-anarchist than that of the cyber-libertarian. The arc of Assange’s argument is not so much that the public sector’s role in decision-making should be minimized in favor of private entrepreneurs, rather he seems to believe that—insofar as it is possible without descending into complete chaos—institutions should be diminished in favor of extra-institutional actors (i.e., individuals and small voluntary associations). Wikileaks is attempt, on the part of extra-institution, to exercise more accountability over institutions through the mechanism of transparency. It should be noted that Assange has resisted attempts to label him as “anti-institutional,”explaining that he has visited countries where institutions are non-functional and that this sort of chaos is not what he has in mind. One, thus, has to infer that Assange believes institutions are a necessary evil—one that must be guarded against through enforced transparency. 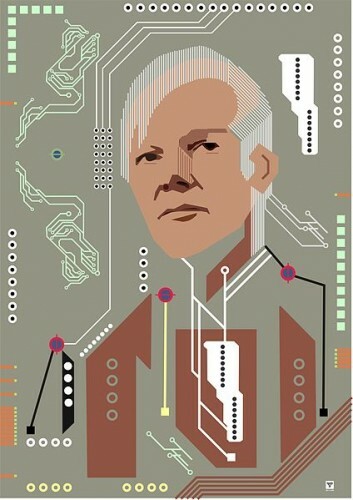 In the classic sociological framework, we might position Assange as a sort of conflict theorist: People require institutions for order and stability, yet are perpetually threatened by the tyrannical inclinations of such institutions; he believes the people can only gain the upper hand in the struggle by preventing/exposing institutional secrets. From the previous statements, we can conclude that Assange has two central assumptions about our social world: 1.) Institutions, by their nature, will always become corrupt when not closely monitored. 2.) Secrecy is a necessary precondition for corruption; diminish secrecy and you diminish corruption. To take a bit of a critical angle, it appears that the degree of faith in transparency expressed by Assange and his compatriots seems to necessitate either a lack of attentiveness to power and/or a sort of naïve optimism that deeply embedded power relations can be easily overturned. Does simply knowing that an institution is corrupt really sufficiently empower us to end that corruption? The lack of prosecutions in light of the all the malfeasance and outright criminality that led to the recent collapse of the financial sector would seem to indicate otherwise. As Michel Foucault and countless other theorists have argued, there is a definite relationship between visibility and power; however, it may not be as direct or as simplistic as Assange appears to believe. To be fair to Assange, he is not necessarily arguing that, through transparency, individuals are empowered to hold institutions accountable but, instead, that information can be used strategically to play institutions against one another. secrecy is important for many things but shouldn’t be used to cover up abuses, which leads us to the question of who decides and who is responsible. It shouldn’t really be that people are thinking about, Should something be secret? I would rather it be thought, Who has a responsibility to keep certain things secret? And, who has a responsibility to bring matters to the public? And those responsibilities fall on different players. And it is our responsibility to bring matters to the public. At his most cynical and, perhaps, megalomaniacal, Assange sounds as if the only person that can be trusted to regulate governments and businesses is Julian Assange. More generously, we can interpret that Assange’s rhetoric and WikiLeak’s actions indicate a general antagonism to institutions that places them much closer to the cyber-anarchists of Anonymous than the cyber-libertarians barons of Silicon Valley (e.g., Mark Zuckerberg, Eric Schmidt) who support enforced transparency, primarily, for their own financial gain. "Assange is an activist, not a philosopher, so we ought not to expect his theoretical statements to be completely coherent;"
I think you're giving philosophers too much credit! Great post PJ. I think the contradicting positions Assange seems to be making about institutional authority is actually a key debate in most anarchist circles. The aspirations of (most strains of) anarchism do not advocate a "return" to anything, nor do they profess utopian visions. Most anarchists and post leftists will say, "I don't know what I want the future to look like, I just know how I want to get there." It is the "getting there," in those small horizontally-organized groups that often attracts most of the attention. Labels are one thing, actions and results are another. Many tried to put labels on things like free open source software and the occupy wall street movement, but what happens in action and results always seems to deteriorate the labels. Even the labels placed on government and corporations are being found out to not really fit. Labels are static, but ;life is not, labeling someone good can lead to a mask of covering up their wrongs. There is a feedback loop the founders, the framers of the United States intended in "Of the people, by the people, for the people" along with identifying the peoples right and duty to keep their government in check, and upon insistence of the government not to follow this feedback loop, it is the peoples right and duty to put off such government and replace it is governing that will. Even examples of bad government are given so to make clear the founders intent and understanding of its importance of this feedback loop. All systems require a valid feedback loop, be it government, military, economic, science, math, and even learning and guided missiles require a feedback loop to stay on course. Bradley Manning is accused of leaking massive amounts of information the U.S. Public, The People have a right to, a need to know, so to do their proper duty of providing the government with course correction feedback. The government in return is to listen and work in accord to this feedback. Julian Assange made this information or similar information available to the U.S. public where it is naturally unavoidable anyone else in the world may also view such information. As the government, in the interest of the people they are supposed to represent, work for and are paid by in the form of taxes (far larger amount of money than lobbyist do), are suppose to referee business to keep the business game fair.... and they have obviously and seriously failed to do so. Occupy Wall Street movement is the peoples feedback to the government. Why is the Government ignoring the Founders intended feedback loop? Ok, So the Declaration of Independence is not Law, for it is more powerful in being the spirit and intent of all valid US law. There is a misconception past, recent and current government has some power over the founders intent. They DO NOT! The Declaration of Independence makes that very clear. The founder documents including the U.S. Constitution and Bill of Rights are solid. It is the Government which is not and the founders even saw that probability and instructed us "the people" as to what to do about it. JULIAN ASSANGE, for what ever he may be labeled, what he has done is to participate in the feedback loop the US Government has wrongly ignored, avoided and suppressed. Its got to be the oldest technique of deception, what I call bit flipping, where claims are made against another by those guilty of the very claims they make against another, in effort to take public focus off their own guilt. Clearly this is what is happening. There have been several responses to this post (some approved, some rejected) that treat this piece as if it is a criticism of Assange and WikiLeaks. It's not clear to me what about the post gives such impression. In any case, I wrote this essay because, as I started listening to and reading Assange, I was impressed at just how sophisticated Assange's philosophy is. I realized the mainstream press is giving a pretty superficial account of his motivations. I'd argue that this post is a pretty sympathetic treatment. I'm certainly a supporter of using Web-based tools to hold institutions accountable. However, let's not deify Assange or fall into some sort of rigid dogmatism. It is both healthy and productive to openly debate these issues. "To take a bit of a critical angle, it appears that the degree of faith in transparency expressed by Assange and his compatriots seems to necessitate either a lack of attentiveness to power and/or a sort of naïve optimism that deeply embedded power relations can be easily overturned." I think that is just a limitation of working in a 'small group of extra-institutional actors'. Organisations like Wikileaks really should limit their targets to something manageable. If they tried to be more than enforcers of institutional transparency, they would either need to grow considerably or would spread themselves too thinly. The high technical proficiency required to deal with the encryption means Wikileaks can't operate on an autonomous model like Anonymous. I dont see the Wikileaks project as naive, just a component of something that is much bigger than any non-institutional actor. I find Julian Assange to be more of an opportunist than an activist. Research his personal beliefs and you will find many establishment themes. There is a third side to this coin, the cutting edge which was barely touched upon here, that being the larger issue of what truly defines national security issues. Should Jullian's earlier "leaks" be considered a breach of national security if they have been previously published in the New York Times? Would it have been ethical to leak secret government documents such as Operation Northwoods or Operation Mockingbird if it meant American citizens were directly threatened or coerced? Should crony capitalist activities of NGO's like the Council on Foreign Relations, the Trilateral Commission, the Bilderberg Group, the Committee of 300, the Rockefeller Foundation, the Federal Reserve private banking cabal, the Fortune 100 companies or the "Four Horsemen" of Wall Street driving government's foreign and domestic policies toward the demise of our republic be exposed? I would say the answer to that is a no-brainer. These people need to be held accountable for their treason and prosecuted. Big government was never our friend. The founding fathers knew that. Great article. The writer's point that ideological coherence should not be expected from an activist is a good one. It probably serves as better conclusion than the one presented. I'd note that on Bill Maher a few weeks ago, Assange said he subscribes to what could be interpreted as the Madisonian factionalist idea of government, made up of different groups with opposing goals. Certainly Assange is alert to the fact that his sympathizers include both liberal civil libertarians and anarchists, so he's going to try to play it down the middle.